So there’s a crazy rumour going round that Summer is on it’s way… like most of us who know the British weather all too well, I’ll believe it when I’m rummaging around in the attic for a fan and turning the airing cupboard upside down trying to find a lighter duvet! Admittedly, the nights are getting a little bit warmer and soon it will be time to put the 10.5 and 13.5 tog duvets away in favour of a lighter, cooler option. In this blog, we’ll go through a few of those options and explain a little bit about each one. because it’s breathable, l ightweight and it offers a wider range of tog ratings that most other duvets. 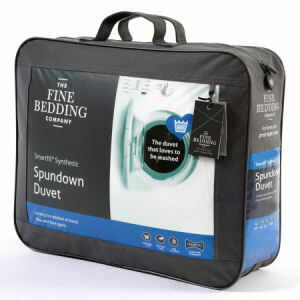 Aside from the 13.5 tog and 10.5 tog options, the Spundown duvet is available in 7.0 tog which is ideal if you still want a bit of warmth at night, 4.5 tog which is very much a standard Spring / Summer duvet and the 3.0 tog which is one of the lightest and coolest duvets on the market. The Spundown 3.0 Tog Duvet is a great choice if you really feel the heat at night but you still want the comfort and cover of a duvet. The Breathe Duvet boasts temperature regulating properties which will create a healthy sleep environment and promote a great night’s sleep. The Breathe climate control duvet is 80% Smartfil® and 20% Modal. The exceptionally breathable Modal fibres are derived from natural wood pulp and help to wick away moisture from the body. 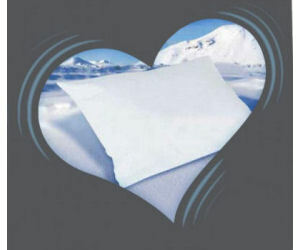 Pair a 4.5 tog or 7.0 tog Breathe duvet the Breathe Pillow for complete temperature controlled comfort. that cover all possibilities. A Four Seasons duvet is comprised of 2 duvets, a 4.5 tog and a 9.0 tog, which can be used individually or buttoned together to create a 13.5 tog duvet. 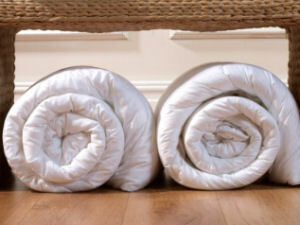 Four Seasons duvets are available in Spundown, Goose Feather & Down, Goose Down, Breathe and Boutique Silk. for those who prefer the softness of a feather and down duvet. 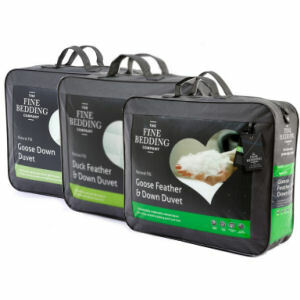 The Fine Bedding Company’s natural duvets include Duck Feather & Down or Goose Feather & Down, both of which are available in 4.5 tog. Both duvets have a ratio of 85% feather to 15% down, however the Goose Feather & Down is lighter and more breathable than the Duck Feather & Down. The luxurious 60% Goose Down Duvet is incredibly light due to it’s high down content, which means less filling is needed to achieve the desired level of warmth. Have a warm shower or bath before bed, a cold shower will cause your body temperature to increase to counteract the cold. If possible, leave curtains and blinds drawn during the hottest parts of day to keep the Sun out. If you’ve got an attic it is worth opening the hatch as the heat will rise. Stay hydrated throughout the day and into the night. Keep a glass of cool water at your bedside to quench night-time thirst. Keep a cool, damp flannel to hand and use it to moisten your face, neck and wrists if you wake in the night. This will help to lower your body temperature as some of it will be evaporated away. 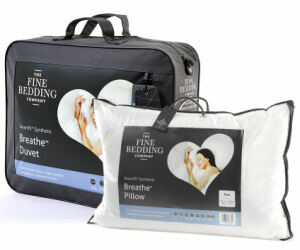 Breathe Duvet, Breathe Pillow, Cool Touch Pillow, Duck Feather & Down Duvet, Four Seasons Duvet, goose down duvet, Goose Feather & Down Duvet, Spundown Duvet, The Fine Bedding Company. Bookmark.